Finding and identifying the source of water damage can be a bit tricky. Water always travels the path of least resistance, which means water coming from an upstairs bathroom might show up along a wall in your living room. Or perhaps there is a roof leak, and water is entering your ceiling and traveling to the lowest point, often a light fixture or pooling in an area near the wall. Thermal imaging using infrared cameras helps detect damp spots in floors, ceilings or walls. It also helps restoration professionals track down the source of the water, making it easier to solve water damage mysteries. Infrared cameras are a powerful tool that spots hidden water damage before extensive damage occurs. Infrared cameras show temperature differentials and thermal patterns. The rainbow colored images can help identify cold spots due to drafts or uneven insulation, but can also help to spot moisture as well. Because evaporative moisture cools the surface of nearby materials, water spots are often seen as dark blue spots on an IR camera. Moisture trapped near the roof can sometimes show as a warm spot, as heat from the roof causes the temperature of the water to rise. Because there are many variables involved, only a skilled technician should use and interpret the thermal images from an IR camera. When Should IR Cameras Be Used? We use IR cameras to detect moisture issues before physical damage or mold is evident. They can also determine the extent of damage by locating moisture pockets in drywall, ceilings, flooring, and other building materials. We then track the moisture back to the source of the water. An IR camera is an effective tool for finding areas of water damage quickly without demolishing the property. 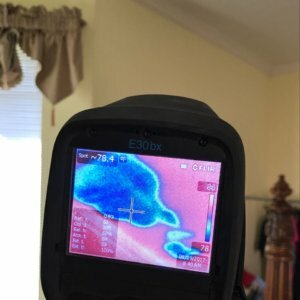 While IR cameras are useful for locating hidden pockets of moisture in your home, it is just one of many tools a water damage restoration professional can use. Moisture meters should be used in combination with IR cameras to confirm the presence of water. IR cameras do not detect moisture, they do, however, measure temperate differentials that may be the result of water damage. Using an IR camera helps speed up the restoration process and reduce your losses. After water damage, an IR camera identifies all the affected areas. This allows cleanup and restoration efforts to be more precise. This means the cleanup and drying process can begin sooner, reducing the possibility for mold growth. Generally, the faster cleanup and restoration occurs, the lesser the damages. Thermal imaging is just one way the professional team at Regent Restoration locates water damage in your home. If you suspect you have a water damage problem in your home, contact us today.